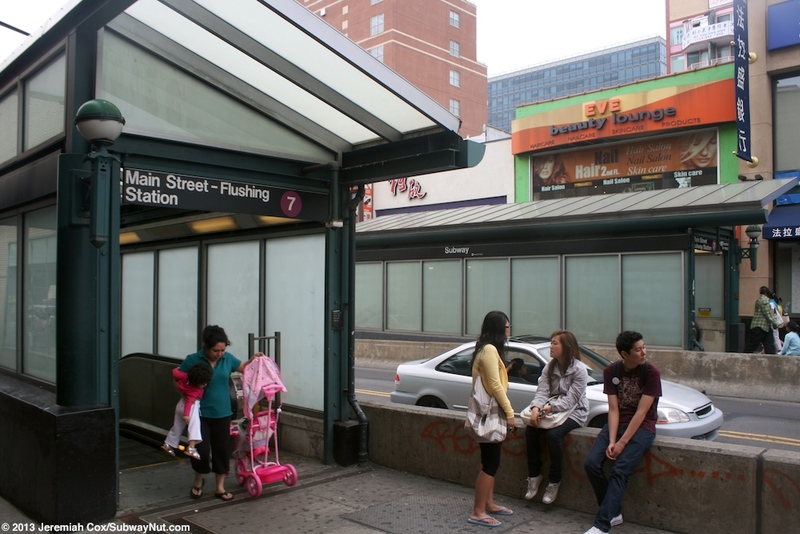 Flushing-Main Street is the underground terminus of the 7 trains and beneath the heart of downtown Flushing. Trains dip back down into a tunnel for this surprisingly deep after crossing the Flushing River just before College Point Blvd. 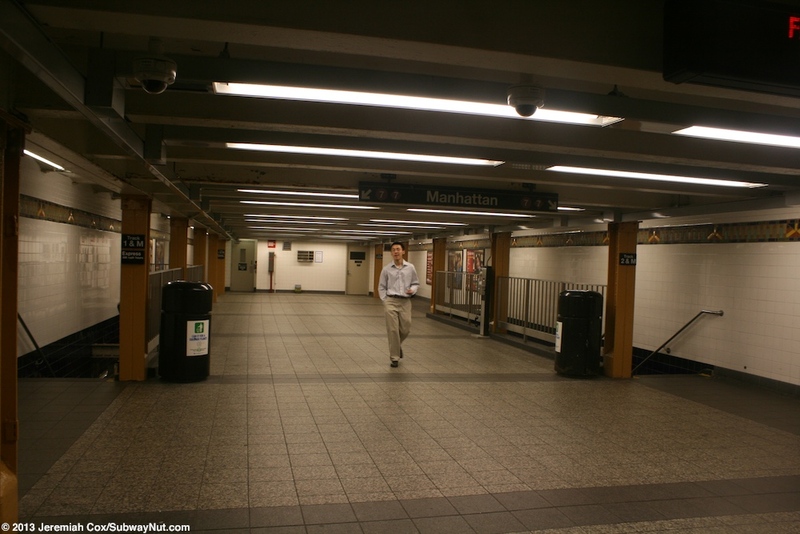 This short segment of subway (with a station) is one of the shortest in the system at only about a quarter mile long. 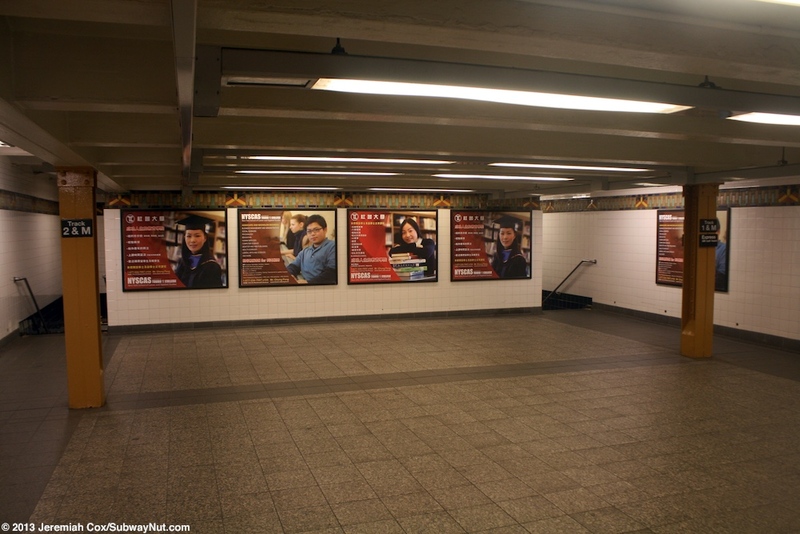 The station is the busiest in Queens and 11th in the system overall (2012) with 19,034,789 annual riders. 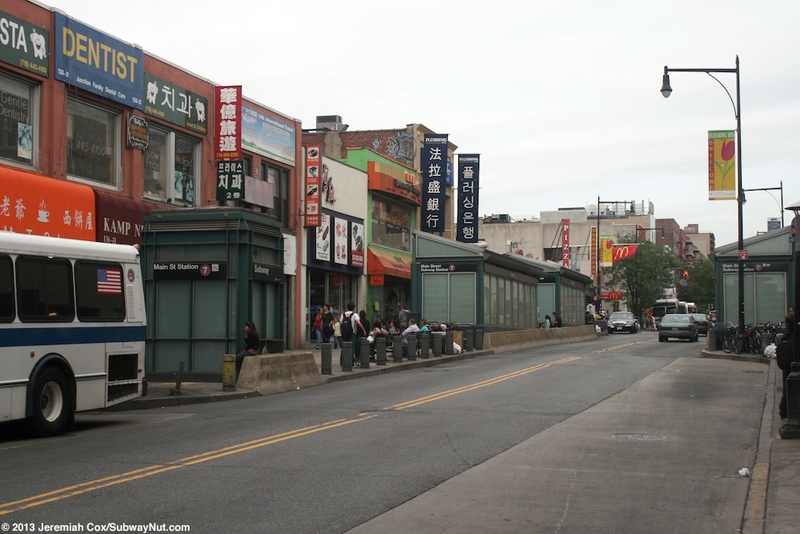 The station serves both the busy Asian shopping district and is a transfer point for buses deeper into Queens. 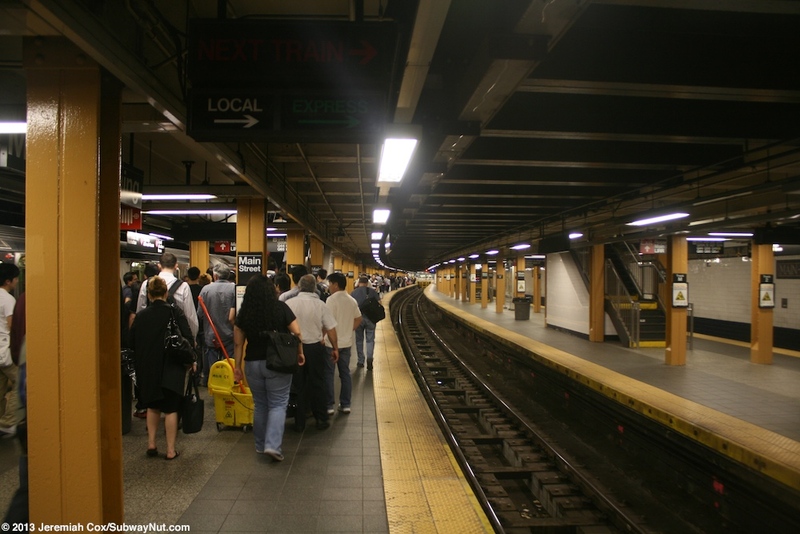 Proposals have existed over the years to extend the subway deeper into Northeastern Queens but none of these have come to fruition. 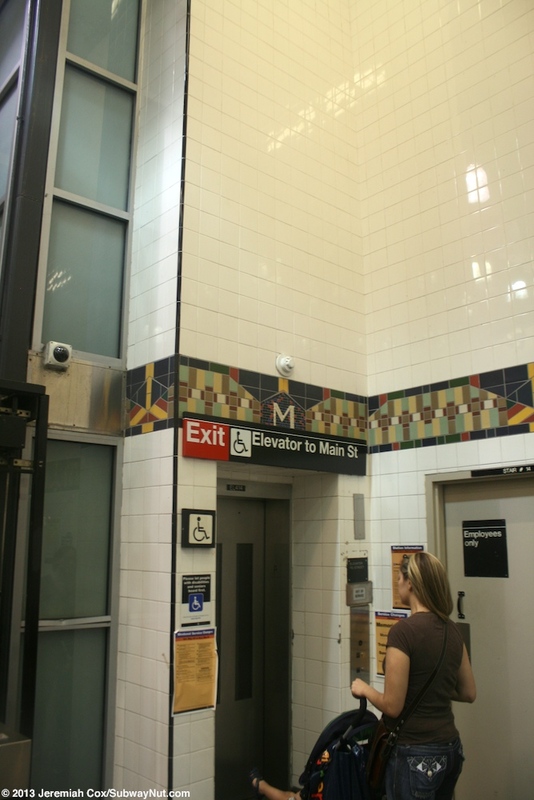 All would require removing the ADA entrance that was added as part of the 1999-2000 renovations. 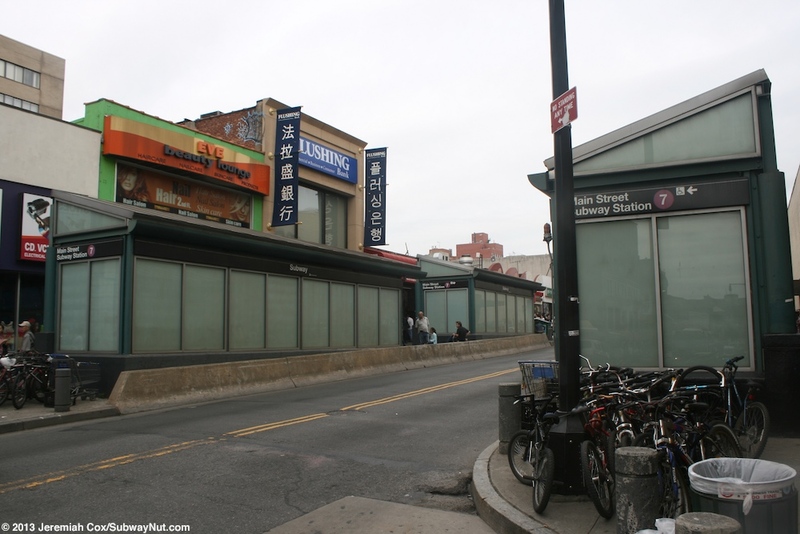 There is also the Flushing-Main Street LIRR station but the stations aren't unified since this station is a block south with confusing entrances that must deter ridership. 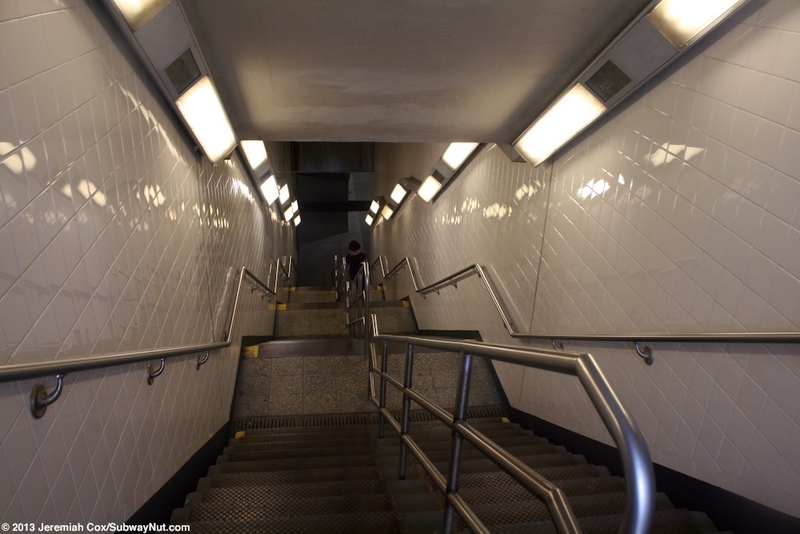 The station opened on January 2, 1928 and was renovated in 1999 to 2000 that made this station fully ADA compliant. 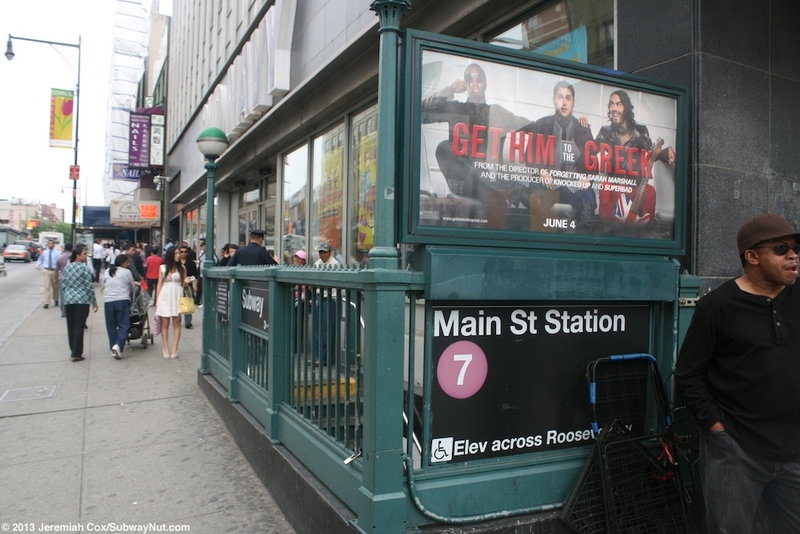 The station itself is designed for the high-capacity service the 7 train receives with three tracks and two island platforms like an express station. Tracks are numbered 1, M, and 2. Trains terminating on Track M open their doors on both sides. 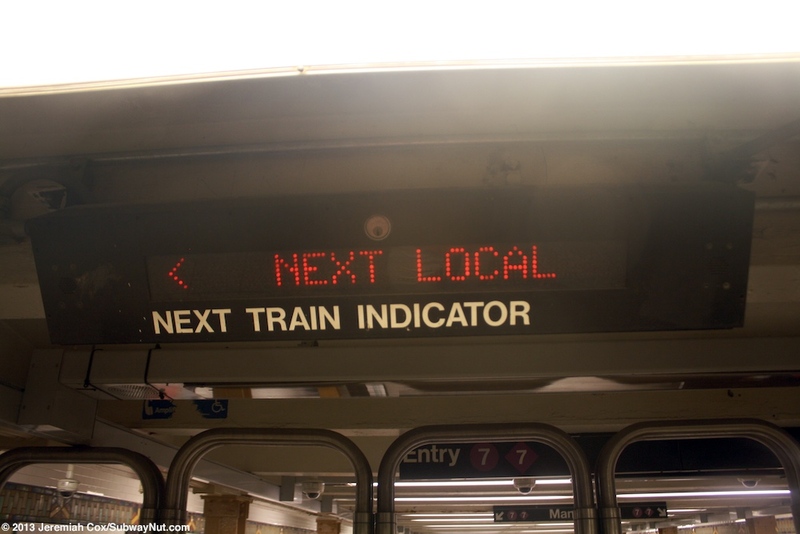 Next train indicators consist of black LED signs and light boxes, the indicators include if a train is a Local or an Express (to Manhattan during AM hours only) and permanent signs tell passengers that Track 1 & M's platform is the one for Express Trains AM rush hours. 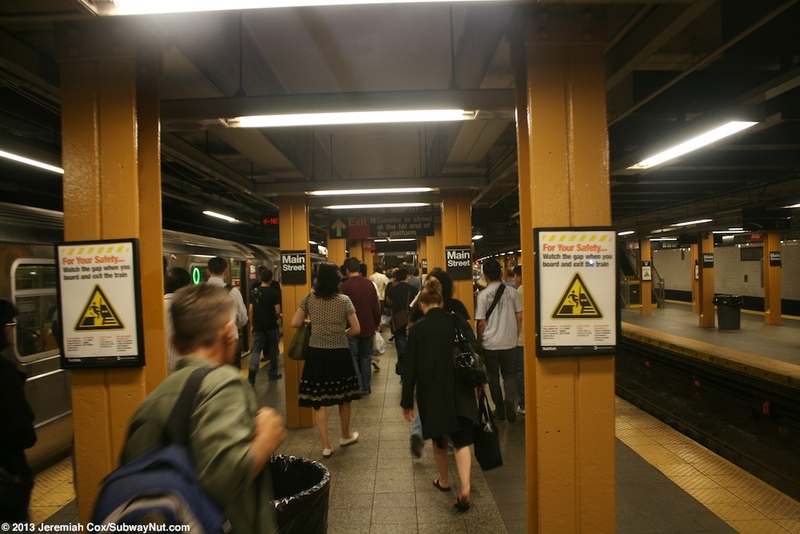 The platforms are quite narrow with a line of dark yellow columns along each track. The track walls have a dual-contracts era trimline with M's in it at regular intervals. 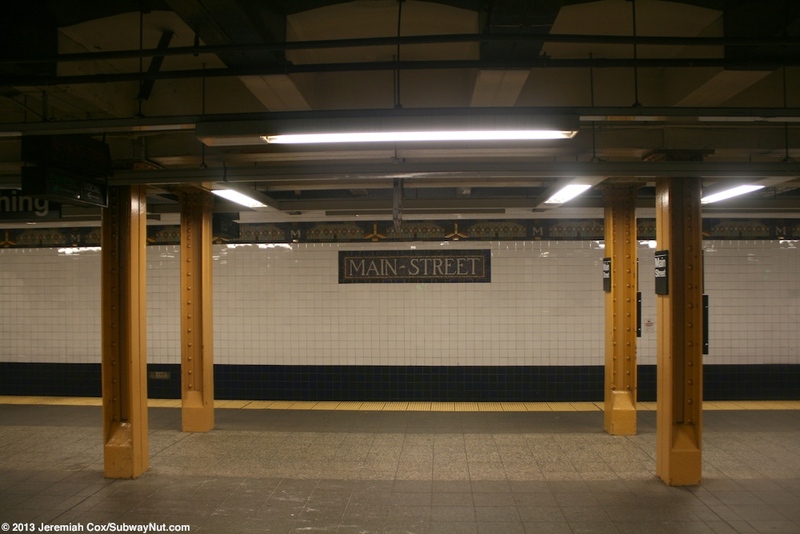 Beneath are name tablets that say Main Street. 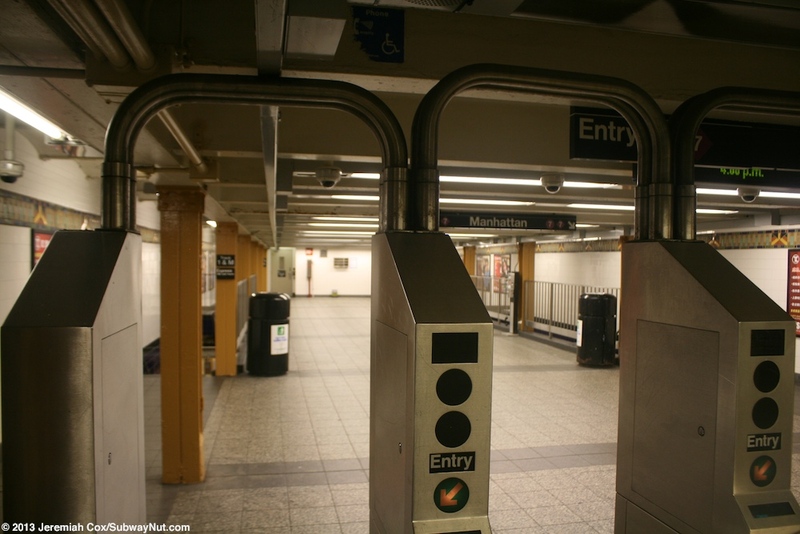 The station currently has two exits both full time and retaining token booths since the station is so busy. 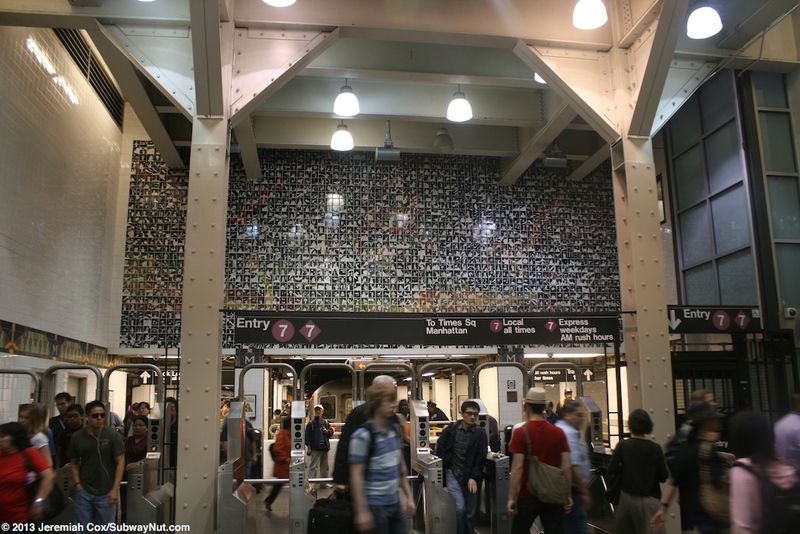 The original exit is via a full-length mezzanine long mezzanine area there is a central fare control area with turnstiles on both sides dividing this mezzanine into two halves within fare control. Each of these halves has two staircases down to each platform. The extreme ends of the mezzanine aren't open to the public and devoted to crew rooms. 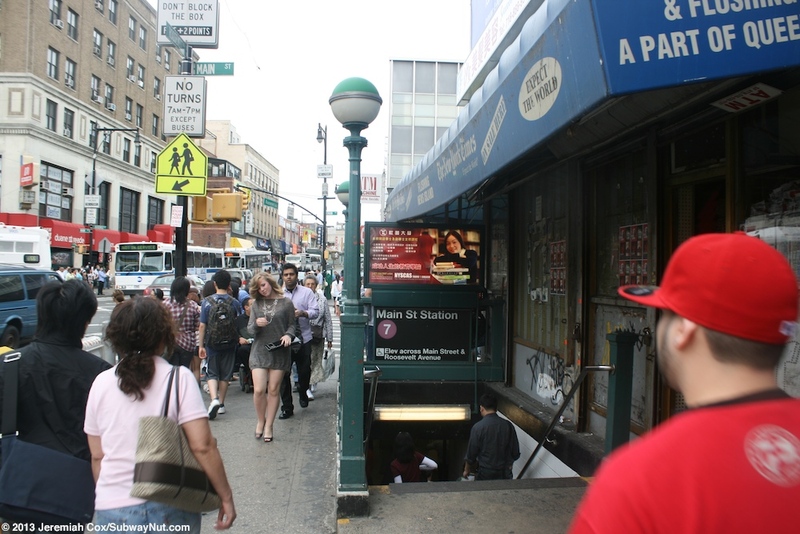 Streetstairs lead up to Main Street and Roosevelt Avenue; two up to the SE corner and one up to the NE, NW, and SW corner. The new ADA entrance that opened in 1999-2000 and is at the same level as the platforms and beyond the end of the bumper blocks for each track, with the bumper block of the middle track in the middle of it all. 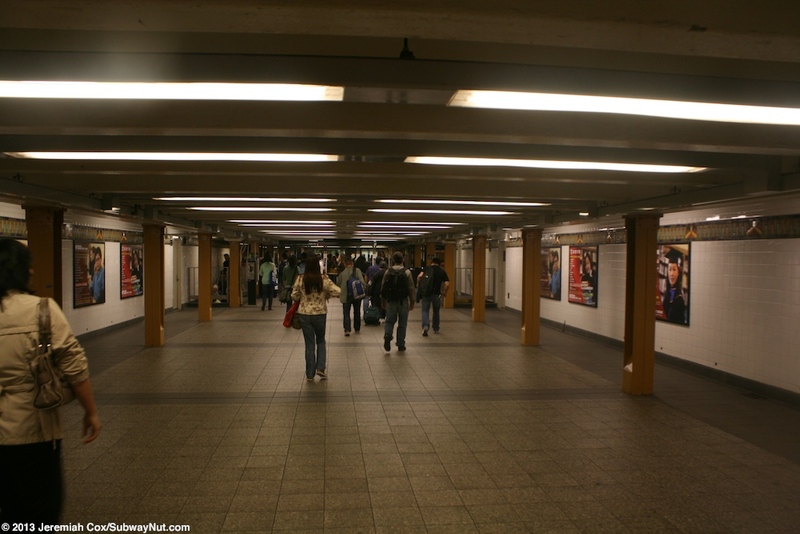 Here the end of the mezzanine above is just before the turnstiles and the entrance area becomes an airy, extremely high ceiling where the depth of the station beneath the street is clearly visible. Entering passengers look up at Happy World just beyond the turnstiles high up on the exterior wall that is the end of the mezzanine. 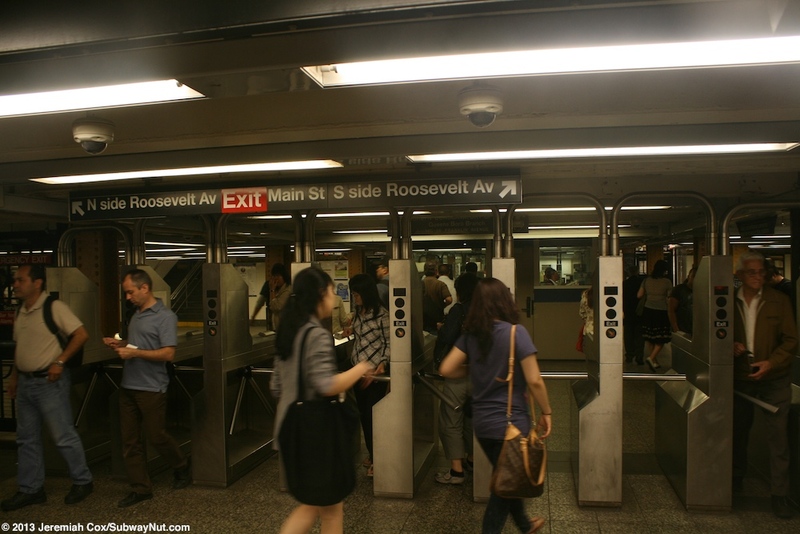 To reach the street there is first the station's one elevator directly from this, the platform level up to the street that was the main reason (as well as to mitigate crowding) for building this new entrance up to the north side of Roosevelt Avenue. 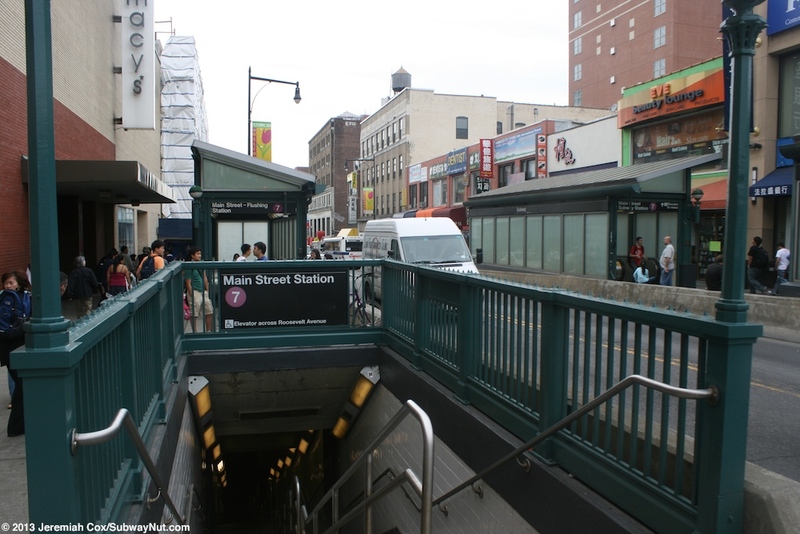 Next are three two abreast escalators that all lead up to the street in green and opaque glass enclosures on the sidewalk that take up what was originally the parking lane of Roosevelt Avenue between Main Street and Lippman Plaza (Union Street is the next actual cross-street), two are up to the north side of the street and one to the southside. 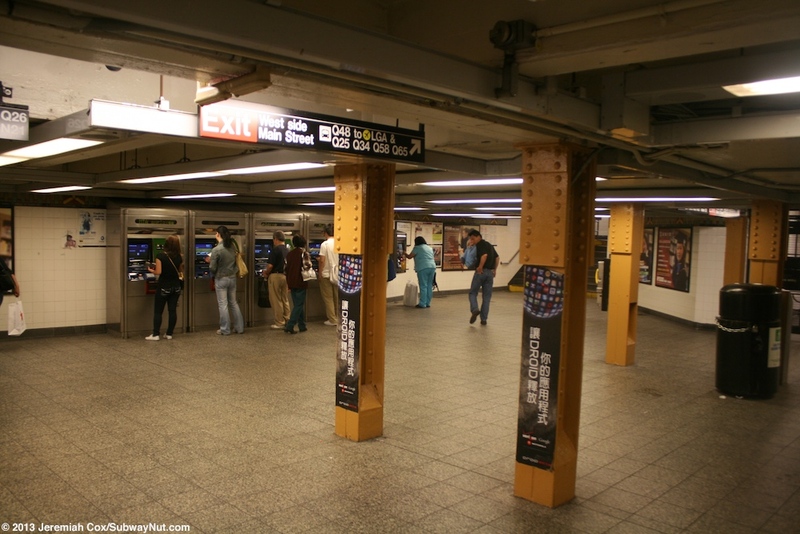 The two across from each other closest to the turnstiles are always in the up direction; the second one on the north side is in the down direction. 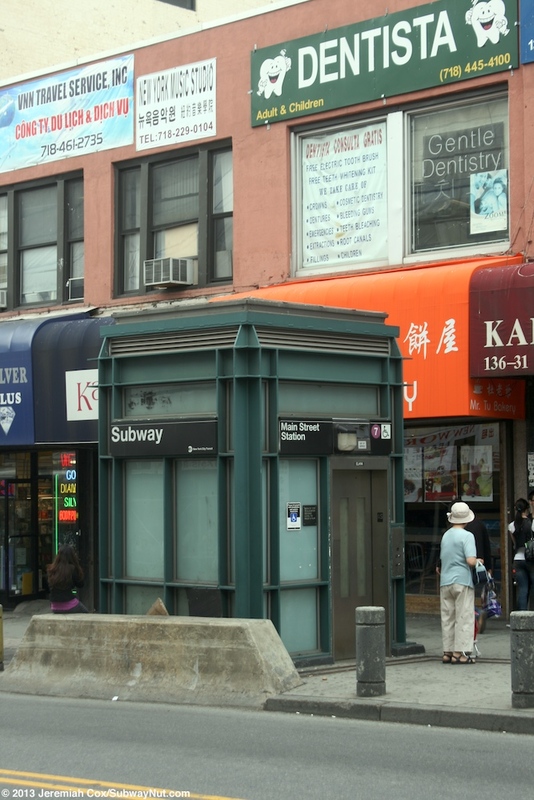 On the south side of the street is finally a long staircase up to a street stair (Flushing-Main Street is quite a deep station) beyond the escalator.